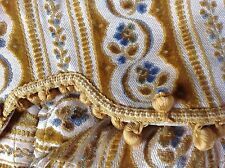 A large antique French chanvre linen pillow/cushion c1800s. It is basically open at one end with no closure, this could be added if so desired - stuff with a stuffing or cushion of your choice. One small red cross stitch monogram of MG which is to the top of the opened end. 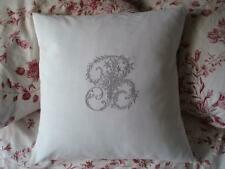 ( Cushion Shown is in Antique Rose colour ). All cushion covers have envelope back & are fully machine washable. I also have this wonderful French linen available in many different shades, white, cream & ecru. ( Cushion Shown is in Silver Grey Colour ). Hemp is a such a wondrous textile. Grown for rope and twine, so thick and strong. Hemp mixed with French linen gives a more subtle mix, much easier on the skin. I've embroidered a stunning heart to modernize the cushion, a mix of old and new. I also have this wonderful French linen available in many different shades, white, cream & ecru. 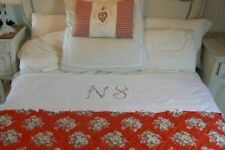 Cushion Cover All Initials. ( Cushion Shown is in Poppy Red colour ). 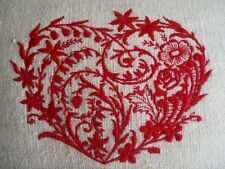 A red embroidered heart on a pure white linen background is simply delightful. I am particularly fond of the embroidered hearts. Don't they make yours skip a little beat ?. I also have this wonderful French linen available in different shades white, cream & ecru. 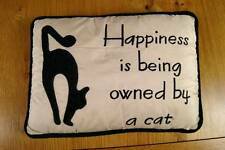 All cushion covers have envelope back & are fully machine washable. Embroidery available in most colours. 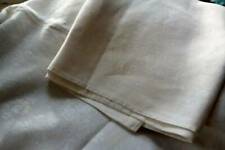 I also have this wonderful French linen available in different shades white, cream & ecru. All cushion covers have envelope back & are fully machine washable. Beautiful flowing design, so elegant, so French.